I just had the privilege of speaking about game design and gamification at North by Northeast Interactive. While I want to clean up my slides to be useful to a new reader, I’ve collected a few links and resources either mentioned in my talk or directly relevant to the subject at hand. I’ll add more soon, but this should get you started! Sebastien Deterding’s Meaningful Play, Pawned, Just Add Points, and Don’t Play Games With Me! Kevin Slavin on a rather broken Saatchi & Saatchi study which conflates everything from social, to games, to gamification in ways that could not help but confuse those surveyed. Sebastian Deterding on the same study. Gamification.co’s blog about both, the comments thread is well worth a read as Slavin dissects the issues further. An article on O’Reilly by Gabe Zichermann wherein he begins addressing the criticisms of gamification, but the real meat is in the comments with Deterding providing several of the most well thought out critiques of the entire space thus far. Jesse Schell’s tracking of the Gamepocalypse. Chris Hecker on Achievements Considered Harmful? In the presentation one of the things Matt talks about is the process used to develop Dopplr, which mostly revolves around discussing and sketching concepts until it seems about right, then just building it quickly. Once it’s built you can see if it works or not and start making changes. He mentions that Boris has a turn of phrase for this which is excellent, “sculpting, not painting.” I love that, it really gets to the heart of what prototyping and working with testable pieces is all about. If you want to see this in action in a great pressure cooker, hit up the Game Design Workshop at GDC where the instructors will encourage you to get something, anything, playable ASAP. Once it’s playable you can start shaping it with real world feedback, sculpting the game and letting the process take you to nifty places. Huzzah! Quit painting design documents and start sculpting your game! The path to Interaction Designer parallels Game Designer? Although clearly there are differences in perception, “…in addition to the young cubs we might imagine negotiating six-figure salaries.” the other quotes are all issues that Game Designers face regularly. We work at the point where the user enters the system and a million little factors affect that experience, making it inherently nebulous to those outside of the field. The problem is severely compounded because our language of design is currently very limited. We continue to crib terms from other fields to describe what we do, or have conflicting definitions. “Fun”, anyone? Game Design has this problem as well, everyone working in games has played a game leading to the “everyone is a designer” syndrome. Horror stories and personal experience abound of producers or other authority figures, making ridiculous requests for changes to a game because they feel their experience as a player makes them just as informed as the designer. We a,re aided somewhat by the complexity and scope of most games, it’s clear that someone has to architect that experience and define it. For an Interaction Designer I imagine that having an interaction perceived as straightforward (using a web page for example) makes justifying their contribution a more uphill battle. Or perhaps it’s an oft repeated but short uphill struggle with each new client. A good article, and I think it’s time to dig into the Interaction Design world some more. Perhaps they’ve answered some of the questions we’re wrestling with in games. Author jamesPosted on January 26, 2008 Categories Design, Game DesignLeave a comment on The path to Interaction Designer parallels Game Designer? Space Time Play is out! My copy arrived last week, and I haven’t had time to read it yet (must finish Designing Interactions first!) but there are some really tantalizing titles in the table of contents. Design Patterns are Dead! Long Live Design Patterns from Jussi Holopainen and Staffan Bjork immediately caught my eye, I saw their first presentation on the subject at GDC several years ago. Chaim Gingold has dissected Pac-Man. Jane McGonigal on Ubiquitous Gaming. The list goes on, but each is a brief essay on topic, pared down by tight word count constraints. (Reviewers were asked to keep it under 2500 characters, spaces included.) Can’t wait to read the myriad of perspectives. 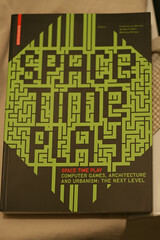 Author jamesPosted on October 6, 2007 Categories books, Design2 Comments on Space Time Play is out! I think it’s safe to say that Volume 01 of Pecha Kucha Night in Montreal was a great success. Everybody had a great time, saw something new and interesting, and Boris got to stretch out his stage legs a bit. 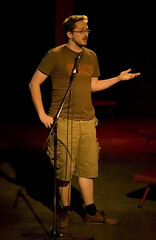 The full speakers list is up at montreal.pecha-kucha.ca and I’ve put the photos that actually turned out up on my Flickr. It was certainly an educational evening for me as I tried learning my new camera on the fly while keeping an eye on the Keynote slideshow. You can tell which shots were taken later in the evening as I started to figure out the appropriate settings. I started trying to do this because I wanted to attend such an event. Boris’ return to Montreal was perfect timing to get it off the ground and there’s not a hope it would have happened without him. I’ve been slammed with a pre-Alpha then Alpha milestone schedule at work and before I knew it things magically started to coalesce. I tracked down a few speakers, did some promotional work and other odds and ends, but Boris made the magic happen. When it was all said and done I think the speakers felt they had participated in a really solid event, we had a lot of fun, and everybody started talking about the next one right away. Along the way it went from an event I wanted to attend to a thing I can’t imagine not doing. If you attended and took photos, please tag them with PKNMTL! Highly recommended if you can catch a screening. It seems to be doing a roadshow right now, and the only word on a DVD release is Fall 2007.